What is the Asian Longhorned Beetle Doing in Cincinnati? Actually, the ALB has not been seen in Cincinnati at this time. Only in Bethel, which is east of Cincinnati. It’s close, of concern, but as of this date there have been no confirmed sightings in Cincinnati. It was also through packing cases that the Emerald Ash Borer, EAB, made it’s way to Michigan. But what really accelerated the proliferation of the EAB was transporting firewood to other locations such as Cincinnati. That is why the Governor of Ohio, John Kasich, has quarantined the Tate Township area with strict penalties for transporting firewood from this area. If you are interested, here is the Executive Order. Since the Asian Longhorned Beetle, or ALB, was discovered east of Cincinnati in Tate Township, there has been a lot of coverage in the news media. But what exactly is the Asian Longhorned Beetle? Here is a picture below. Click the picture to enlarge it. One of the most obvious traits is the ALB’s size. With a body of 1 inch to 1.5 inches long, this is a really big beetle, and easily seen. Also note the length of the antennae! Next, you notice the shiny black body with the white spots. The coloration, the size, and length of antennae all add up to make the Asian Longhorned Beetle stand out. All is not lost. 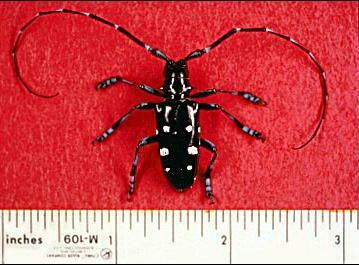 In spite of the alarm shown at the discovery of the Asian Longhorned Beetle near Bethel, Ohio, it can be controlled. The City of Chicago has successfully eradicated the ALB, and in the Northeast of the United States the Asian Longhorned Beetle has been brought under control. If you see a beetle that matches this description, and sign of infestation, call Ohio’s toll free hotline 855-252-6450 and report it. If you can capture one and put it in a jar, do so. Then put it in the freezer so that an ODH representative can inspect it.